Those who visited our stand at Bauma, 2016 will have seen the world premiere of the latest MB model, the new screening bucket MB-LS220. 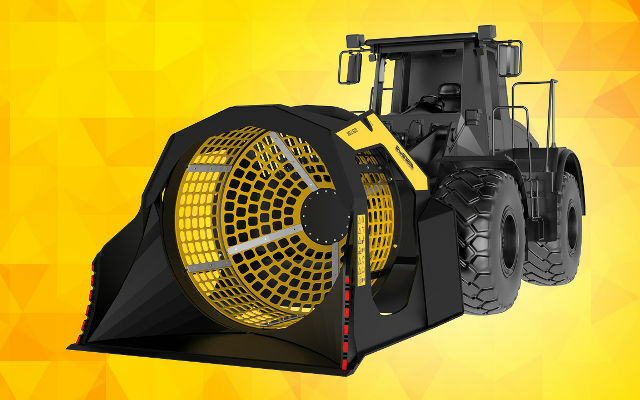 The MB-LS220 is not just a screening bucket, but the screening concept evolution: designed specifically for owners of loaders and backhoe loaders from 12 to 35 tons, who need to select waste material but until now, had no option available to them on the market. First of all great flexibility. The new MB-LS220 allows optimization of loaders and backhoe loaders, transforming them in a few minutes into an efficient mobile screening plant, able to process debris in all the process phases. As it does not need to operate over the pile of material, as is often the case with other excavator screeners, the new MB-LS220, can be used to facilitate and speed the processing of the material on different sides of the same construction site. The new screening bucket has many applications: used in any type of process for separation of waste or natural materials. The new MB-LS220 can sift material of various sizes. For example, it can be used in drainage jobs to obtain an end product that can act as protection for underground pipelines. Why did we invent the new MB-LS220? As per tradition, MB always tries to offer to customers innovative solutions that allow them to work in the best conditions, optimizing the customer's fleet with this new screening bucket. Constant research and attention to customer needs put MB in a position to offer the most powerful and comprehensive range ever. What are the range details? All MB screening buckets are equipped with interchangeable modular panels to allow a rapid change of grid size. The unique and innovative conical basket shape is designed to significantly increase the hourly production performance and to sift all the material scooped, with no residue.